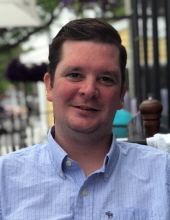 Robert J. Wilkinson, age 34 years, died, Wednesday, October 31, 2018 at his home in Berkeley Heights NJ. Born March 30, 1984 in Red Bank NJ, Rob was the son of John and Patricia (Kite) Wilkinson. Rob was a true sports enthusiast, he graduated with a master’s degree from US Sports Academy. He was a member of the wrestling teams for Hunterdon Central Regional High School and Northampton Community College. One of Rob’s favorite pastimes was to watch sports on TV with his wife, Chelsea, especially the New York Jets. Rob worked as a Teachers Aid for Shepard Preparatory High School in Morristown for many years. His passions included fishing and boating and spending time with his family - Rob was a lovable person who would do anything for someone in need and he will surely be missed by those that knew him. Rob was survived by his wife of seven years, Chelsea (Wade) Wilkinson, his parents, John & Pat Wilkinson of Flemington NJ, his sister and brother-in-law, Nadine and Denis Russo of Southington CT, his in-laws, Shawn & Matthew Wade of Flemington, his sister-in-law and brother-in-law, Kimberly and John Cahall of Lebanon NJ, his brother -in-law, John Wade of Flemington, and his nieces, Jennifer and Leah Russo and Jasper Cahall. Visitation will be Monday, November 5, 2018 from 3:00 until 8:00 pm at the Holcombe-Fisher Funeral Home, 147 Main Street, Flemington NJ 08822. Cremation will take place privately on Tuesday. Those attending the visitation are asked to wear clothing in the color green in Rob’s memory. Memorial contributions in Rob's name may be made to the First Day of School Foundation, PO Box 4069 Hamilton, NJ 08610 where a scholarship for the students Rob loved to work with is being created. "Email Address" would like to share the life celebration of Robert J. Wilkinson. Click on the "link" to go to share a favorite memory or leave a condolence message for the family.